If you are searching for a home for sale in Boise, Idaho, you have found the right place. Our website allows you to search for all active Boise, Idaho homes for sale. 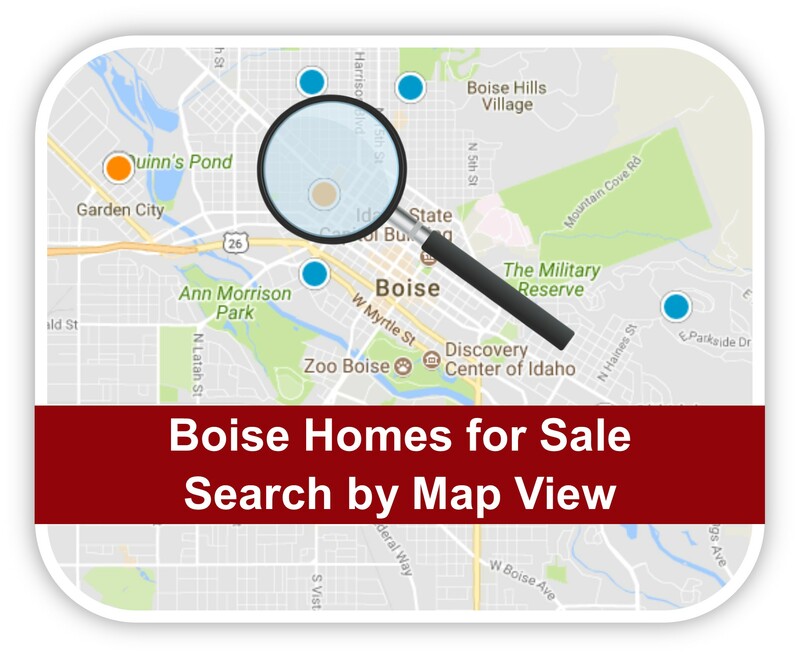 Properties for sale in Boise are updated daily from the MLS on our website so be sure to return here for the newest listings for sale in Boise, Idaho. With our website, you can set up saved searches and get new listings emailed to you daily. Properties are easily viewed in a list view by area, or you can use our interactive map to search for your new home. Boise, Idaho is truly a hidden gem and the locals would prefer to keep it that way! It’s great place to live, work, and call home. Whether it’s the vibrant cultural and recreation opportunities, the friendly people or the mild climate, Boise and the surround communities afford a quality of life second to none. Great jobs, affordable housing and a safe, clean and vibrant downtown all add up to explain why so many people love to call Boise home. Nestled in the Treasure Valley against the beautiful foothills, Boise is part of a thriving metropolitan area of over 550,000 people. Boise is the capital of Idaho and is the largest metropolitan area in Idaho. While the area is quickly growing, there is still a unique sense of community that can be seen and felt living here. Located in the high desert near the western edge of the Rocky Mountains, Boise offers exceptional recreational opportunities for the outdoor enthusiast. Idaho is known for world famous white-water rafting, skiing, maintain biking, road cycling, hunting, fishing, backpacking, and camping. The foothills provide miles of trails for hikers and bikers alike. Winding through the heart of the city, the Boise River offers activities such as fishing, rafting and tubing, white water surfing, and swimming. The Greenbelt runs alongside the river and provides miles of paths for biking, running, or walking. Boise’s mild climate offers four distinct seasons throughout the year. The hot and dry summer highs average around 90°F to 100°F most years. Winters are moderately cold with an average temperature in December around 30°F. Snowfall averages 20 inches in the valley and much more in the mountains much to the delight of skiers and snowboarders alike who love to visit Bogus Basin Ski Resort located within 30 minutes from downtown Boise. The spring and fall seasons, while mild, and can tend to be brief but are highly anticipated and stunning as the seasons make their changes. Although Boise’s history has been largely rooted in agriculture type backgrounds, the job economy has become a quite diverse workplace offering plenty of opportunities for everyone. Many small business start-ups have found wild success from their humble beginnings in a garage to worldwide well-known businesses in short times. Scentsy and Bodybuilding.com are just a few businesses that got their start in the Treasure Valley and are now large employers in Boise and the city of Meridian. While traditionally, industries of agriculture, forest products, and mining continue to contribute to the economy, high-tech, tourism, retail, trade, healthcare, and small businesses also contribute to the vibrate employment climate in Boise. For employment opportunities, you can contact the Idaho Department of Labor at their website or also visit the Boise Valley Economic Partnership Website for a summary of regional labor market data. Boise isn’t a place for people who merely want to observe life but rather a place for those who want to embrace adventure. See all the Newest Listings in Boise Here! Pop. Density: 2,591 /sq mi.